Wow it has gotten chilly outside! Apparently there have also been some sightings of snow in Illinois 😦 I don’t want Fall to end! It is by far my favorite season. I love the cool weather, crisp air, and beautiful colors. I do enjoy December leading up to Christmas, but I’m so not ready for the season-that-shall-not-be-named yet! How do you feel about companies already advertising for Christmas? I DESPISE it. It’s not even Halloween yet! I just want to enjoy my favorite season a little longer. Grrrr. Okay, enough ranting. I feel like I haven’t been eating extremely well lately. I blame it on the fact that it’s been a really busy couple weeks at work with parent-teacher conferences, open house, testing, etc. So last night I really wanted something light and healthy. 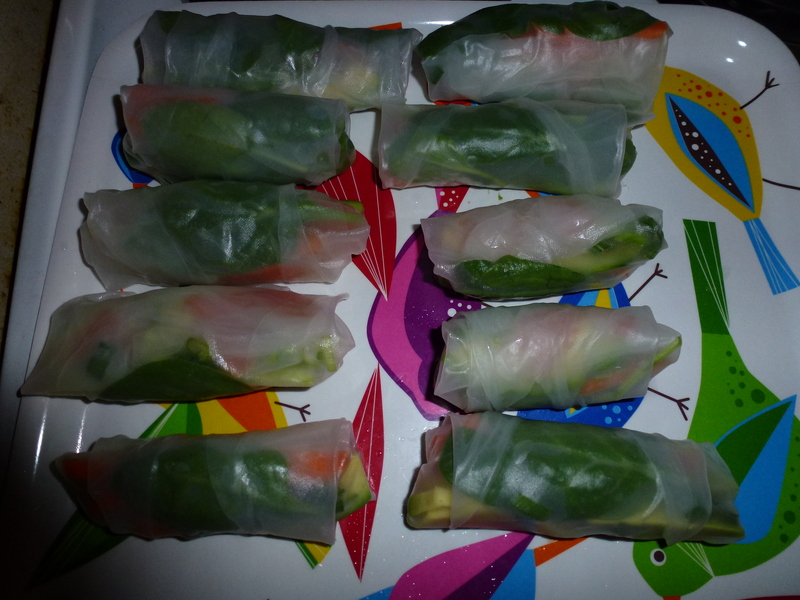 I thought of the perfect meal: Spring rolls. I added a little twist though and incorporated smoked salmon – it added so much flavor! 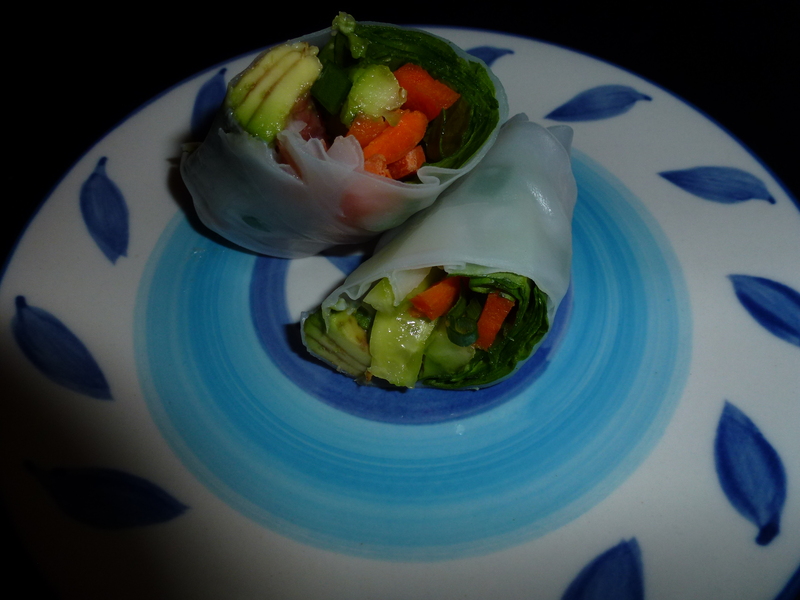 The beauty of spring rolls is that they are really hard to mess up! Even if they don’t look professional, they will still taste great. They are also very customizable – you can add any veggies you want and even tofu, meat, or seafood. 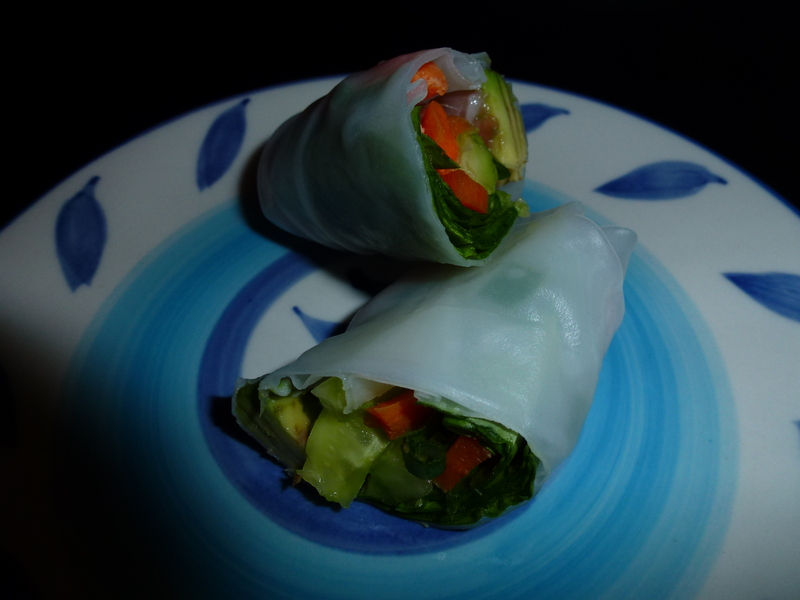 Here is how to make my spring rolls with a twist: Smoked Salmon Spring Rolls. First, assemble your ingredients. 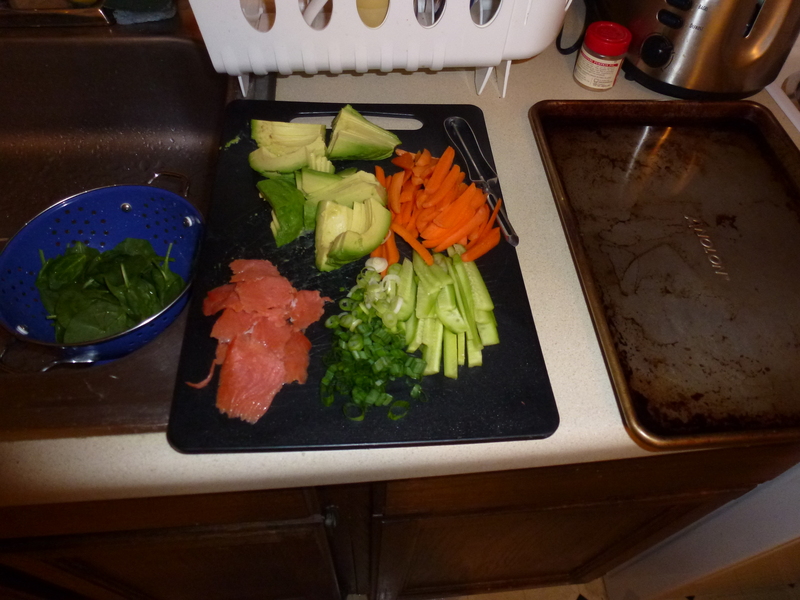 We have cucumber, carrots, green onion, avocado, spinach, and smoked salmon. 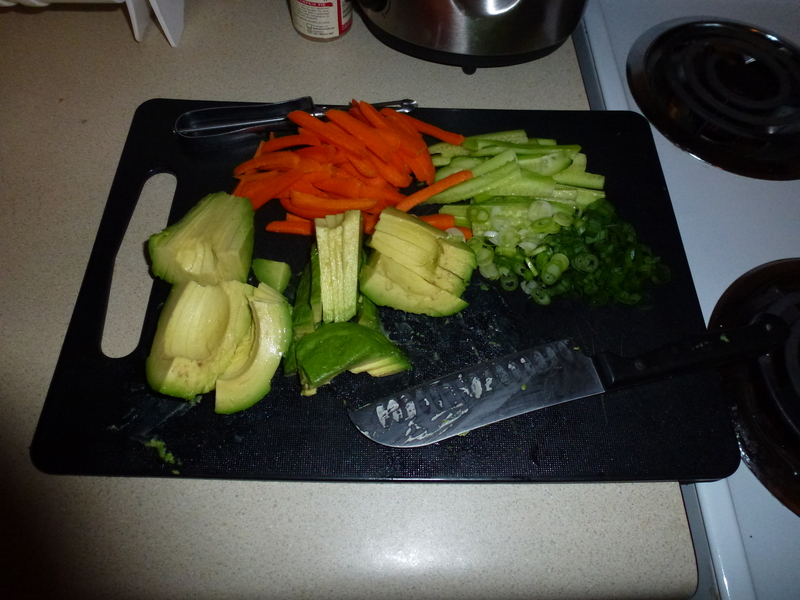 I don’t have an exact amount of these because you can really add however much of each ingredient that you would like. Next, take your rice paper wrappers. You can get these in most grocery stores, in the Asian foods aisle by the soy sauce and rice noodles. They start out hard, then after soaking them in hot water, soften. 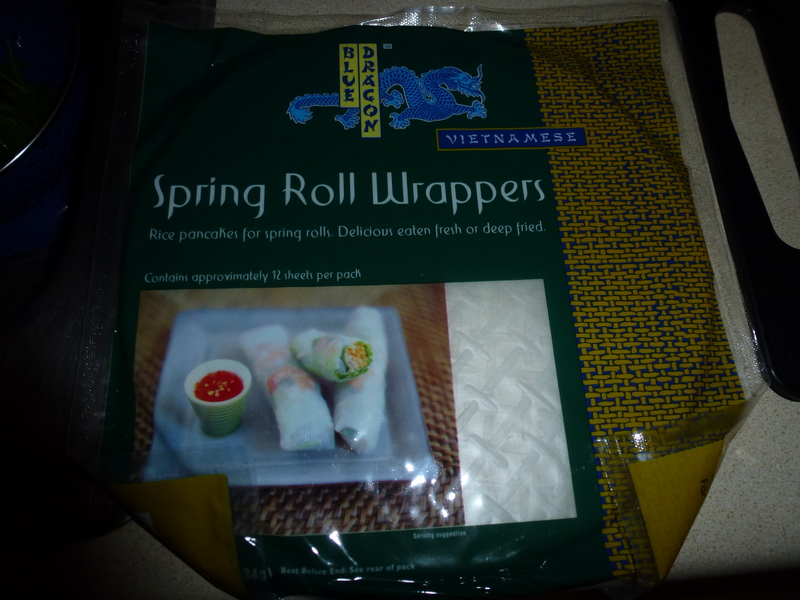 They become very stretchy so you don’t have to worry about being extremely careful with them when wrapping the spring rolls. Pour some hot water into a dish, and soak a rice paper wrapper in it for about 10 seconds, or until it softens. I used a cookie sheet to soak my wrappers in. Lay the wrapper onto a clean surface then add your ingredients into the center. Roll the wrapper just like an eggroll. Fold down the tops, and then roll from one side to the other, wrapping it snuggly. Don’t worry – it won’t break! Repeat until you run of out of ingredients or wrappers! I served mine with soy sauce mixed with some brown sugar that was then heated a little in the microwave. Any soy, sweet and sour, or teriyaki sauce would be good though. *I didn’t include any amounts here because it’s really up to you how much to use! 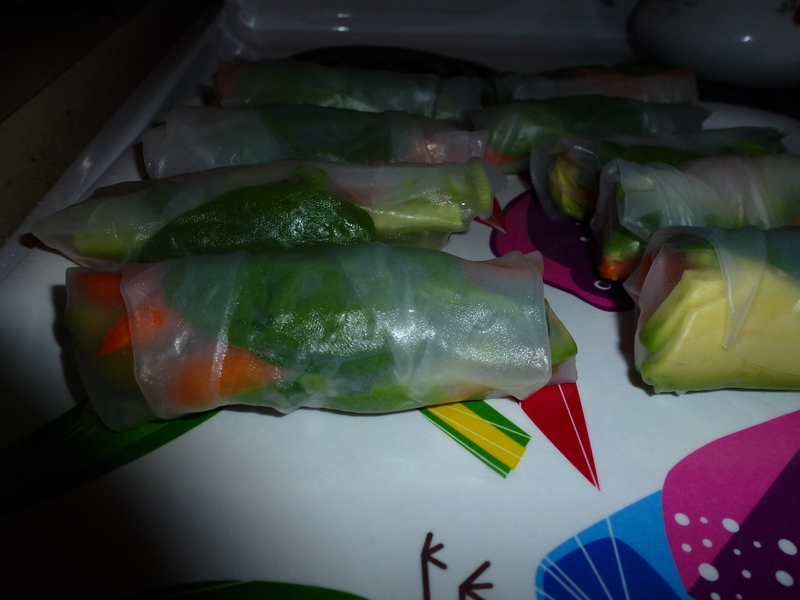 I made 10 spring rolls and used 1 mini cucumber, about 10 baby carrots that I chopped up, 1 green onion, 1 avocado, a big handful of spinach, and about 2 ounces of smoked salmon. Lay out all your ingredients. 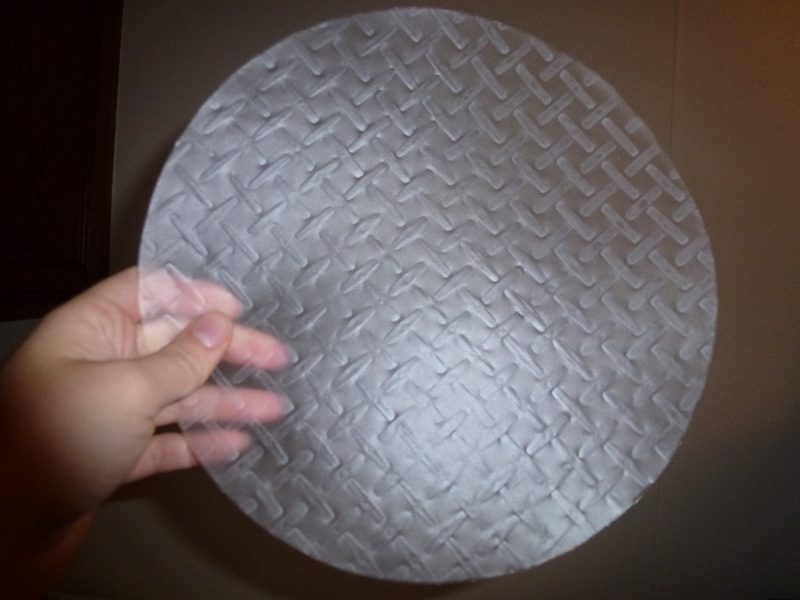 Soak a rice paper wrapper in a shallow dish of water for about 10 seconds, or until soft and pliable. Place the softened wrapper onto a clean surface, and line up your ingredients in the middle. 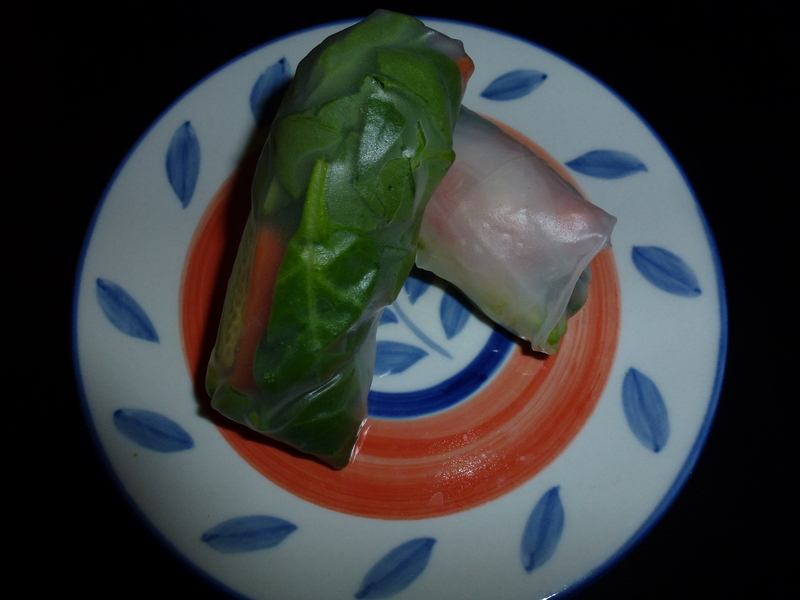 Fold in the tops of the wrapper, then roll tightly from one side to the other. Repeat until you have used all your ingredients and/or wrappers. Serve with soy sauce or sweet and sour sauce. I hope you make these! They taste so fresh and light – definitely what I needed. And I have to say, the salmon definitely gives it a lot more flavor. I’ve made these without salmon before, and they are good, but I think the salmon takes them to a whole new level. 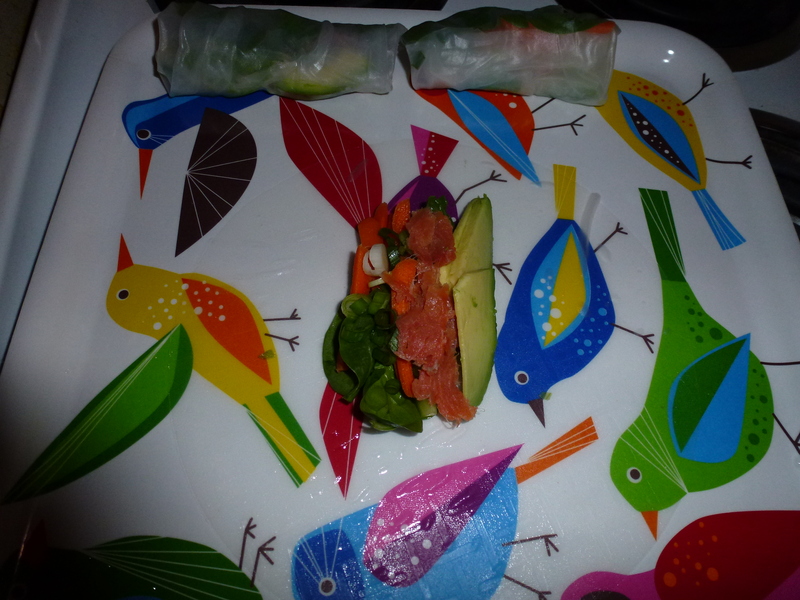 This entry was posted in Asian Inspired Food and tagged Asian, fresh, healthy, how to, smoked salmon, spring rolls. Bookmark the permalink.